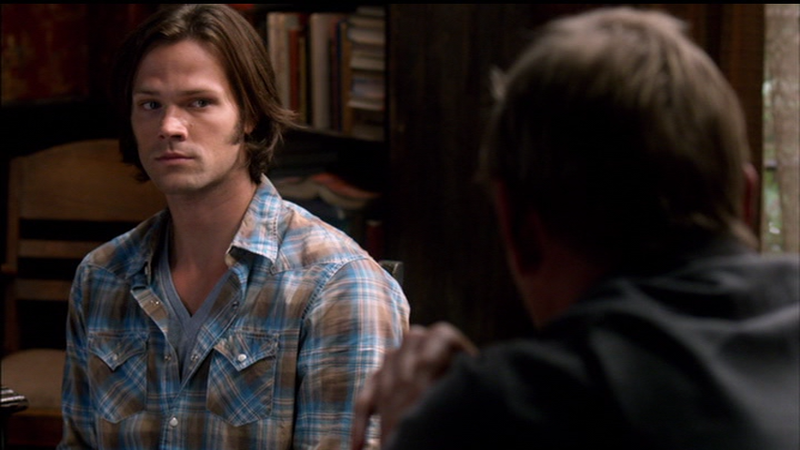 One of Sam’s uglier plaid shirts, in my opinion, (sorry Sam...and Jared, who has worn this to a convention, I believe). It has pointed pocket flaps and is another snap up. Plaid on the shoulders runs diagonal to the rest of the shirt. In Sin City (3x04), Sam wears it at the very end of the episode when he talks to Ruby. Sam wears it while training with Ruby in the summer of 2008, as we see in flashbacks during I Know What You Did Last Summer (4x09). In After School Special (4x13), Sam wears it to go see Mr. Wyatt at the end of the episode. In Fallen Idols (5x05), Sam wears it at the beginning of the episode while he and Dean drive to Canton, Ohio. In All Dogs Go To Heaven (6x08), Sam is wearing this shirt at the beginning of the episode when Crowley meets them at the diner. In Like A Virgin (6x11), Sam wears this shirt when he joins Dean for the trip to Oregon. In Let It Bleed (6x21), Sam wears this shirt from the beginning of the episode, until after they summon Balthazar to tell him about Castiel and Crowley and ask for his help. In Hello, Cruel World (7x02), Sam is wearing this shirt as he sleeps on Bobby’s couch. He wears it throughout his discussion with Dean about his hallucinations (and field stripping his weapons). He changes out of it before they get the news about the swim team deaths. Haha, thanks. ;) Unfortunately, I won't be adding S7 until fall 2012. So, I'm sure I'll catch it then! I use the DVDs to do it. It's just easier that way for me. :P I'm busy putting S6 up right now. I guess that makes sense. It probably takes forever to go through an entire season. Oh great! I've spotted quite a few well-known shirts in season 6, you'll probably recognize even more of them. It does take a bit, yeah. Plus I've got to make caps of any new clothes (or improve the caps of old ones) as I go - hence getting a high quality version without any CW logos or ads. It's funny. This shirt did nothing for me, was so unremarkable that I barely noticed it at all...until 7x02. I don't know what it is, but it looks very soft and quite flattering in this one, IMHO. Maybe they used a blue filter when filming this ep? I think he looks so gorgeous wearing this when sitting on the couch that I actually took a screenshot and used it as wallpaper. It makes his eyes look blue in this scene. Oh man, you are right...that IS the same shirt. I also think you are right in that they lit it softer and in a way that brought out the blue instead of the brown. It DID look quite nice in that scene. I'm not a huge fan of brown and blue together - so I'm already biased against this shirt. But really, I suppose I shouldn't be. I like blue and brown together myself, but it depends on the shades. Turquoise looks awesome with brown, IMHO. And I really, really love Sam in blue in general. I agree about that vertical striped green and yellow shirt...I was looking over my notes when I was cataloguing S6, and I couldn't help but notice that Jared looked like he gained 10 pounds when he wore that shirt. :P I also dont' like the orangey plaids. I like it when Sam wears deep blue (rare) or deep red (more common).